Nestled in the heart of the Palm Jumeirah, Senara is a friendly relaxed British bar and restaurant on the water’s edge of the Palm Jumeirah Marina, boasting some of the best views in town. Senara offer great food made from locally sourced produce, and an expansive drinks menu. 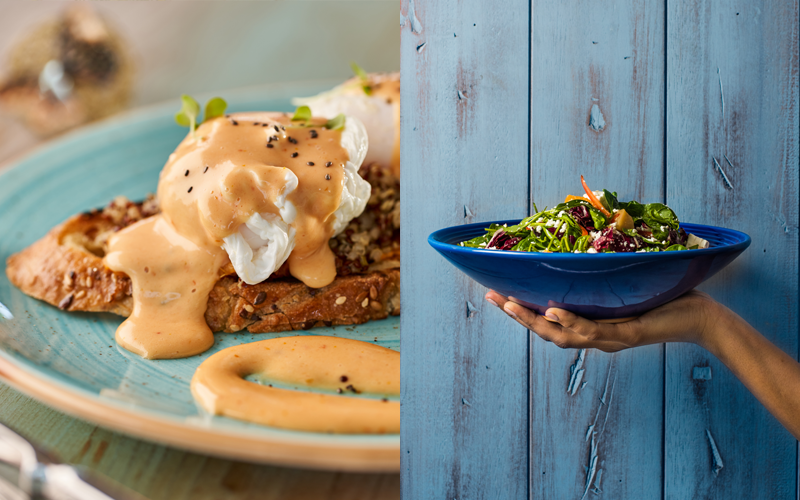 For those on the healthy track this January, Senara has a wide range of nutritious options on offer, including the likes of smoked salmon and eggs, classic eggs benedict, smashed avocado on toast with heirloom tomato salad, and much more. You’ll also find a tempting selection of smoothies, with flavour combinations including mango, passionfruit, pineapple with coconut, and beetroot, apple, ginger and basil. With an open outdoor terrace that’s perfect for the Middle Easter winter weather, enjoy unobstructed views with great British breakfast classics and raw blended juices. Call 04-4516460 or visit senararestaurants.com. Maison de Juliette, an eatery inspired by the beauty of Aix-en-Provence, recently launched its flagship café at the newly opened waterfront destination La Mer North in Jumeirah Beach, Dubai. With a chef hailing from Paris, expect to find dishes on the menu to include the likes of all-day breakfast items like salmon omelette and eggs, salads and sandwiches like le sandwich steak oignon and le toast burratine along with soups like Juliette’s signature onion soup. Open from 10am to 12am, Sunday-Thursday 8am to 1am, Friday to Saturday. Call 04-3855532 or visit maisondejuliette.com. There’s nothing quite like a Saturday spent in comfort, stretching out, indulging with delicious food and beverages. Soak up the sun with healthy treats at Azure Beach at its weekly Saturday brunch from 1pm to 4pm. Expect service to your sunbed, with bottomless packages priced at Dhs225 with soft drinks, Dhs345 with house beverages, and Dhs445 with bubbles. Call 052-7779472 or e-mail info@azure-beach.com. Did you catch the 2017 world record-breaking lightshow at Burj Khalifa on NYE? If not, then fear not; Dubai has extended the extravagant event until March 2018. To enjoy the lights over a bite, head to Karma Kafe’s terrace, which overlooks the hotspot. Serving Pan-Asian cuisine, the menu includes dishes like miso black cod with pickled bamboo shoot and ramen, salmon tataki with herb miso, tea smoked salmon with ginger mirin glaze and Japanese plum coulis, tuna carpaccio with anchovy aioli and truffle oil, plus rack of lamb with miso roasted aubergine and shishito pepper tempura. The light show takes place at 8pm every Tuesday, Wednesday and Saturday, and 10pm on Thursday, Friday and public holidays, and is a must for Dubai residents and visitors alike. Every Tuesday from 6pm onwards, ladies can enjoy three complimentary beverages and 50% off the menu, and for the girls joining with boys, they can enjoy 25% off the bill for their mixed group. Call 04-4230909 or visit karma-kafe.com.